Sen. Rand Paul (R-KY) told Virginians on Monday that New York Mayor Michael Bloomberg is buying $1.1 million worth of TV commercials for Democrat Terry McAuliffe so that he can take away guns and Big Gulps from Virginians. Paul and Republican Attorney General Ken Cuccinelli, who is running for governor against McAuliffe, campaigned at a Filipino Cultural Center in Virginia Beach after Paul and Cuccinelli spoke at Liberty University earlier in the day. 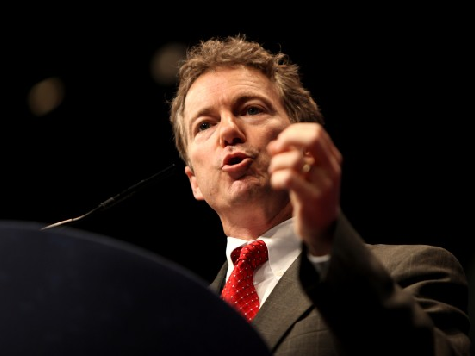 “Once he takes your guns, he’s coming after your Big Gulp,” Paul said, according to Politico. Paul and Cuccinelli reportedly “stopped for Slurpees on the way” to the event. Bloomberg has been one of the strongest supporters of gun control, and many believe that, should McAuliffe get elected, Bloomberg would lobby him to enact stricter gun control legislation in Virginia that would mirror the gun-control legislation passed in Colorado, which cost two state senators their jobs in an historic recall. In New York City, Bloomberg tried to limit the size of sodas that could be served at various establishments, which a state Appeals Court ruled was unconstitutional.